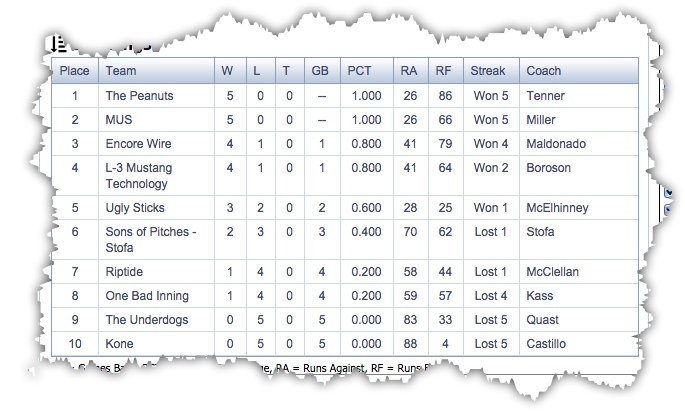 AP (Allen, Texas) — The Mighty Peanuts are perched at the top of their division after five games for the first time in club history. Tonight, they will be striving to break a club record as they go to work against One Bad Inning (OBI) in an attempt to move to 6 wins and no losses on the season. The Nuts are cautious, as they have not faced the One Bad Inning crew since last Spring when they topped the squad 12-7. Mason is on assignment in Asia. Replacing him at catcher will be Saavedra, who hopes to avoid injury while filling in at the difficult skill position. Most of the Nuts enjoyed strong performances at the plate, including Cole, who continues to impress with his “mister automatic” gold medal golf shots to center. After starting off the first inning tied 3.3, the Nuts rocked Sons of Pitches with the Tenner/Sebert homers in the bottom of the second, scoring 8 runs. Adding to the confusion was the appearance of Brad Dean at first base, appearing in his first game for the Nuts this season. “We knew that guy was suspect too” said Umpire Balls, “because he wasn’t wearing a glove buddy like their regular first baseman.” Dean played well despite the lack of specialized equipment, chalking up several key hits on the evening. As has become their custom, the Nuts faltered in the third, allowing 6 runs but answering with 5 of their own. That would be the last serious threat from the Sons Of Pitches outfit, as the Nuts would finish after 4 and a half innings with 20 runs. One unexpected bright spot for the Nuts was second baseman Saavedra, who managed to play an entire game without injury. The Nuts finished the contest with time expiring, winning 20 – 10 to move to 5-0 on the season. This week, they face the One Bad Inning squad at 8:30PM on Ford Field #2. Notably, OBI has allowed 59 runs this season, with their one and only win coming against the completely helpless Kone crew.